The Northwest Indiana Genealogical Society will meet on Saturday, March 20 at 10 am at the Lake County Public Library in Merrillville. Jeanne Bloom will be discussing the "Toulmin Method of Reasoning." The Toulmin Method is an informal method of reasoning. Jeanne will show how this method can assist researchers in proving some of their genealogical brick walls. She is a Certified Genealogist and a full-time professional researcher specializing in Cook County, Illinois, research. She also works on problem solving and compiling multi-generational family histories. The Northwest Indiana Genealogical Society represents the interests of genealogists in Lake County and Porter County. The public is welcome at the meeting. Looking for any information on William B. and Malona Gibson Gibson, both born ~1814-15 in Montgomery County, NC, moved to Indiana, perhaps Vermillion or Wabash, children born in IN, Elizabeth, Eva Liza Jane and Sarah C Gibson. Moved to Iowa ~ 1855-57. Any info would be appreciated. Grandparents. Seeking info of JOHN W. McGRATH (1825-1876) and wife MARIAH JANE LAKE married 5 Sept 1850 Vermillion County IN. Daughter MARY ELIZABETH McGRATH b July 1851 Vermillion. Was she same MARY ELIZABETH McGRATH who married WARREN THOMAS 7 Feb 1869 Piatt IL? Any other children of JOHN/MARIAH? The Northwest Indiana Genealogical Society, which represents Lake County and Porter County, will celebrate their 40th anniversary by holding a Military Symposium on Saturday, April 17 from 9:30 am to 4:30 pm at the Dyer-Schererville branch of the Lake County Public Library. Ron Darrah will be the featured speaker, and his topics will include the Revolutionary War, Civil War, Spanish-American War, and World War I. The Indiana African American Genealogy Group will meet on Saturday, March 20 from 12 to 3 pm at the Indiana State Library in Indianapolis. The meeting will be devoted to members helping each other break down brick walls and address challenges. To get help, you should provide a detailed overview of your genealogy challenge and the research you have already completed. Please write down your problem and bring copies with you to the meeting. Or, for even better results, send your problem to indplsaagenegroup@yahoo.com. For an example of a well-written problem, please visit their blog. --Thursday, March 25--Indiana State Library, 9 am to 3 pm--Archives I. Basic archival principles, including: acquisition, control mechanicisms, basic preservation and in-state resource availability. --Tuesday, April 6--Indiana State Library, 9 am to 3 pm--Archives II. Advanced archival principles, including: volunteer efforts, copyright and privacy issues, image dating and Web 2.0. --Thursday, April 8--Indiana State Archives, 8:30 am to 4:30 pm--Preservation. Topics will include principles and resources, exhibit preparation, climate control and mending and drying. --Tuesday, April 13--Indiana State Library, 9 am to 3 pm--Government Records. A workshop for professionals who manage county and state government documents. Topics will include scanning and microfilming, retention schedule use and public access issues. --Friday, April 16--Indiana State Library, 9 am to 2 pm--E-Records. A workshop for experienced professionals who work with electronic documents. Dr. Philip Bantin of Indiana University will contact participants to develop the specific topics for this workshop. Attendees can receive Library Education Units (LEUs) for each workshop, and lunch will be provided. Space is limited--the registration form (PDF) must be returned by March 17th. This database is free and is being shared with the Indiana Genealogical Society and the Allen County Public Library's Genealogy Center. There are now over 8,000 entries in the database. The Indiana Genealogical Society has published an index to the 1890 soldiers enrollment list for Martin County. It has been added to the other indexes that are available for purchase in the Shop section of the IGS website. The soldiers enrollment lists enumerated the veterans of all past wars (including the Civil War) who were living in that county in 1890. If the veteran was deceased, the list included information on their widows and children. The Indiana Genealogical Society's indexes contain detailed information from these lists and are published on CD-ROM. IGS has now published the indexes for 71 counties. The Allen County Public Library in Fort Wayne will present a class, "Using Footnote.com," on Thursday, March 18 from 10 to 11 am in the library's Meeting Room A. You'll learn how to browse through documents or search for a specific individual's documents or a historic event using Footnote.com, and also how to view, print, and save original historical and federal documents. To register, call (260) 421-1225 or e-mail genealogy@acpl.info. The Allen County Public Library in Fort Wayne will present a session, "Using Periodicals at the Genealogy Center," on Tuesday, March 16 from 2 to 3 pm in the library's Meeting Room A. The lecture will discuss the benefits of using genealogy and local history periodicals, provide a brief overview of how to use the Periodical Source Index (PERSI), and give information on how to locate a specific issue. To register, call (260) 421-1225 or e-mail genealogy@acpl.info. The Allen County Public Library in Fort Wayne will present a class, "Writing Your Family History: A Primer," on Wednesday, March 17 from 10 to 11 am in the library's Meeting Room A. The class will not be discussing or reviewing genealogy software, but will give an overview of some of the attributes of good genealogical writing and will offer some guidance on how to produce a book or article of lasting quality. To register, call (260) 421-1225 or e-mail genealogy@acpl.info. The Allen County Genealogical Society of Indiana will hold a workshop, "Getting Started in Family History & Genealogy Research," on Saturday, April 3 from 9 am to noon at the Allen County Public Library in Fort Wayne. Instructor Marge Graham will discuss how to gather and organize your information for best results, and how to use proven basic research methods. Participants will also tour the library's Genealogy Center and learn about available resources. The Genealogical Society of Marion County will hold a double program on Saturday, March 13 at the Spades Park Branch of the Indianapolis-Marion County Public Library. At 12:30 pm, Ron Darrah will present a program, "Getting Started in Genealogy," which will give you suggestions for how to proceed and get organized. At 1:30 pm, Cathi Taylor will present a program, "The Story Handed Down Was...Uncovering The Truth! ", which shows how various records were used to prove or disprove a family story. Admission is free. These databases were compiled from the 1890 soldiers enrollment lists for the respective counties. They are premium databases, accessible only to IGS members. There are over 235 databases in the Members Only area. More databases will be added over time. The Allen County Genealogical Society of Indiana will meet on Wednesday, March 10 at 7 pm in Meeting Room A of the Allen County Public Library in Fort Wayne. There will be a program about the 2010 census. The public is welcome. If you have Indiana ancestors, chances are you have run into the research barrier of 1882--the year that the state first required counties to record births and deaths. For those that died before 1882, you may think that you have few resources, save for finding their obituary or tombstone--a task that is even more daunting when you see how many tombstones are illegible or in pieces, if the cemetery hasn't disappeared altogether. Probate records are a great--underutilized--source for death information. 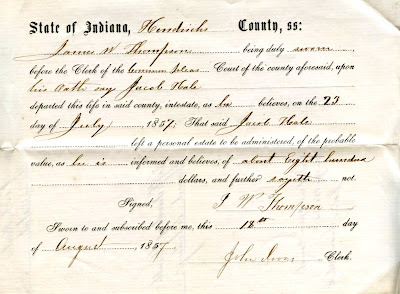 The above (from the Indiana Genealogical Society's Records Preservation Project for Hendricks County), is an example of the kind of genealogy gems that you can unearth in probate records. This affidavit, stating that they died on July 23, 1857, is part of the process of the probate court appointing an administrator for the estate of the deceased. Even people who wrote wills before they died could have a probate record--in those instances, the court would recognize their executor instead of an administrator. So make sure you keep this resource in your research toolbox! Registration is now open for the Indiana Genealogical Society's 2010 Conference, which will be held on Saturday, April 10 at the Allen County Public Library in Fort Wayne. The conference theme is "Charting Our Course." There will also be sessions on immigration records, photo restoration and digital projects. The library's Genealogy Center will be open on Friday, April 9 from 6 pm to midnight for conference attendees. Pre-registration is $30 for IGS members, $35 for non-members. Registration at the door will be $40 for members or non-members. Register online at the IGS website, or download and print the registration form. The Indiana Genealogical Society now has over 235 databases in the Members Only area of its website. More databases will be added over time. 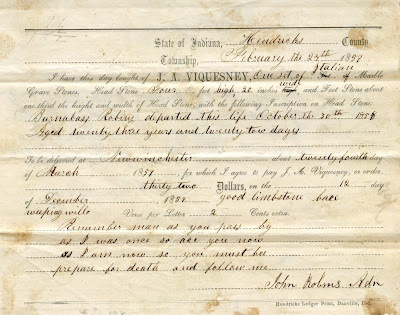 The Indiana Genealogical Society has created indexes to the 1890 soldiers enrollment lists for Johnson County, Knox County, Scott County, Spencer County and Vanderburgh County. They have been added to the other indexes that are available for purchase in the Shop section of the IGS website. The soldiers enrollment lists enumerated the veterans of all past wars (including the Civil War) who were living in that county in 1890. If the veteran was deceased, the list included information on their widows and children. The Indiana Genealogical Society's indexes contain detailed information from these lists and are published on CD-ROM. IGS has now published the indexes for 70 counties. The Genealogical Society of Marion County will meet on Saturday, February 13 at 1 pm at the Irvington Branch of the Indianapolis-Marion County Public Library (5625 E. Washington St.). Ron Darrah will present a program, "A Splendid Little War," about family history and the Spanish-American War. The public is welcome to attend. The Indiana Genealogical Society's board will hold their quarterly meeting on Saturday, March 6 at 10 am at the Plainfield Public Library. This meeting is a makeup date for the February 6 board meeting, which was cancelled due to weather. The Boone County Genealogical Society will hold its monthly meeting at 6:30 pm on Tuesday, February 23 at the Thorntown Public Library. Jamey Hickson will present a program, "Genealogy: Problem Solving." The public is invited to attend. The Indiana Genealogical Society is seeking applicants for the position of editor of the society's quarterly publication, Indiana Genealogist. The editor is responsible for the creation of the 50-page quarterly (published 4 times a year, plus a separate index issue), including receipt of submissions, choices for publication, copyediting, page layout, transmission to the printer, creation of the index, and creation of PDF files for long-term storage. Experience using page layout software (Microsoft Publisher, Adobe InDesign, Adobe Page Maker or something similar) and familiarity with Adobe Acrobat is required. The editor reports periodically to the IGS Board and the Publications Committee and is paid $500 per issue. The Allen County Public Library in Fort Wayne will offer an explanation of their Genealogy Center collection on Monday, March 15 from 2 to 3 pm in the library's Globe Room. If you've taken the tour of the genealogy center but are still confused, this session is for you. A staff member will explain the catalog, microtext area, and how to use the facility. To register, call (260) 421-1225 or e-mail genealogy@acpl.info. The Hamilton County Genealogical Society will meet on Wednesday, March 3 at 7 pm at the Hensel Government Building (10701 N. College Ave., Carmel IN). There will be a program, "Irish Research." The meeting is free and open to the public. While searching on Ancestry, I found an Asa MILLER listed in the Jasper County, Indiana Index to Death Records, 1882-1920. I called the Health Department there and was informed that they did not have a death record of the above. He was listed in the index on page 68 and again on 69. I have been informed by the cemetery sexton in Remington that he is not buried there. The index seems to show a year of death as 1882. Can anyone tell me what avenues are left for researching this individual? I had found him on the 1880 census (age 78)living with his son-in-law and daughter, Albannus and Mary TRAUGH in Remington. I am seeking info on the James Madison Swadley family of Pine Village, Warren County, Indiana, particularly on his daughter Samantha O. Swadley that married a Charles Edward Kelley. I would like to know more about the Hamilton Cemetery in New Carlisle, St Joseph, Indiana. I'm looking for a my James Ranstead who supposedly died on Aug 20, 1836. He was in the Rev War in 1780 from Hampshire, Massachusetts. I'm not able to travel to the area any longer and would appeciate any information that could be passed on. Thank you so much for your help. We live in Scipio and are wondering if the name of our town came from the Roman General Scipio Africanus. There is a town near us named Sardinia which is one of the cities offered to Scipio Africanus by Hannibal. Do you know where these names originated? I am researching the Martin Hill family, a brother of my cousin Ken Hill’s great great-grandfather Thomas Hill. Martin was b. Jan 13, 1803 in Virginia, Married in Kentucky 1824 & subsequently moved to Decatur Co; having at least 2 children, Elizabeth b. ca1838 & Minerva or Mary b. ca 1839. I believe Martin’s wife Ann died in the early 1870’s & he remarried & he died sometime after the 1880 Decatur census. I am looking for any assistance you might be able to give me. I am looking for information concerning Tell City and the Swiss Colonization Society. These two subjects were mentioned in the will of my g-g-g grandfather, Andreas Boeckle(y) (spelled in other various fashions). His will stated that he owned stock in the Swiss Col. Soc. and that he owned lots of land in Tell City. He arrived in the U.S. from Austria in 1852 and settled in Cincinnati. He married Catherine Mohr, who was born in Switzerland. Andreas died in 1861. Are there any existing land records for Tell City or information concerning members of the Swiss Col. Soc.? Thanks for you help. The Indiana Genealogical Society has now added the February 2010 issue of the IGS Newsletter to the IGS Records section of Members Only. The issue contains entries from the "...Always A Hoosier" project, and also has updates from around the state. The Indiana Genealogical Society now has over 230 databases in the Members Only area of its website. More databases will be added over time. The Allen County Public Library in Fort Wayne will offer a tour of their Genealogy Center on Saturday, March 14 from 1 to 2 pm. If you have ever felt overwhelmed by the sheer size of the department, this tour will help familiarize you with the different areas and their contents, as well as the research procedures. Space is limited--to register, call (260) 421-1225 or e-mail genealogy@acpl.info. --Students of University of Notre Dame, Notre Dame (1935)--a listing of seniors as found in the school's yearbook for 1935, The Dome. This database also includes the students' photos and biographical information. --Directory of Businesses in Leavenworth, Crawford County, Indiana (1868)--a listing of business owners in the town of Leavenworth, as found in a railroad and shipping directory for the state. --Directory of Businesses in Dubois County, Indiana (1868)--a listing of business owners in various towns in Dubois County, as found in a railroad and shipping directory for the state. --Directory of Businesses in Tipton County, Indiana (1868)--a listing of business owners in various towns in Tipton County, as found in a railroad and shipping directory for the state. --Miami Indians Who Received Land on Miami Reservation, Grant and Wabash Counties, Indiana (1873)--a listing of Miami Indians who received land on the Miami Reservation in Grant County and Wabash County when it was partitioned in 1873, as found in a newspaper article. These are all premium databases, accessible only to IGS members. The Indiana Genealogical Society has now posted 230 databases to the Members Only area of its website. More databases will be added over time.